Gorgeous Jimi Hendrix shirt says "Move over Rover and let Jimi take over." Jimi Hendrix will always be known as the greatest electric guitarist in the history of music. He is certainly one of the most infuential and important musicians of his era and will always be remembered as an icon to the genre. Our gorgeous Jimi Hendrix shirt is designed as a tribute to that great music we still listen to today and it's a great way to show your love for this rock icon. Our Jimi Hendrix shirt prints beautifully on either light or dark colors and looks terrific on any style shirt you choose. This is a gorgeous Jimi Hendrix t-shirt to tribute the rock icon's music and his life. 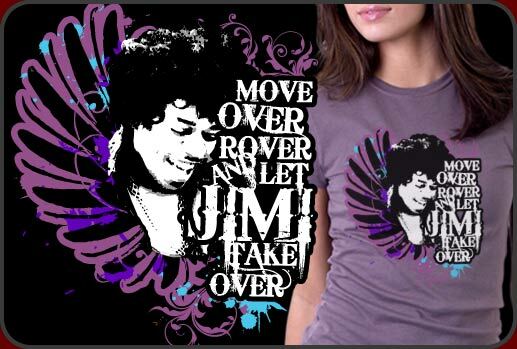 We have loads of cool Jimi Hendrix shirt designs in lots of great looking name brand merchandise. Click the button above and you will find our Jimi Hendrix shirts, Jimi Hendrix tshrits, Jimi Hendrix sweat shirts, Jimi Hendrix jerseys, Jimi Hendrix shirt and Jimi Hendrix ragland shirt. We love Jimi Hendrix music and listen to it all the time here at the studios when we are in a classic or bluesy rock mood. Jimi Hendrix is simply astonishing on the guitar and his music is so moving and powerful. That's why we designed our Jimi Hendrix shirt and made it so that it could fit on so many shirt styles.